Check out the new video “Bottom Your Way To The Top” from Logan Lynn‘s “From Pillar To Post” directed by Jeffrey McHale and illustrated by John Parot. Lynn, click a Portland native, recently signed to the Dandy Warhols’ Beat The World Records, and this is his first release with the label. Lynn’s music is a mix of electronic, dance and pop music, and overall pretty catchy. The video mixes equal parts awesome illustrations and PG-13 man-love to an overall impressive result. If I had heard this song for the first time I may have noticed the significance of the title. But yes, now that I think of it, the title “Bottom Your Way To The Top” has some significance. Either way, cool video from a local artist worth knowing about. There is actually a healthy selection of videos from Logan Lynn over on the media section of his website. He certainly appears to be aware of the importance of video, and managing his “brand” as a musician, including the tasteful art direction that permeates his work. one which had an audio line-in from the mixing board. 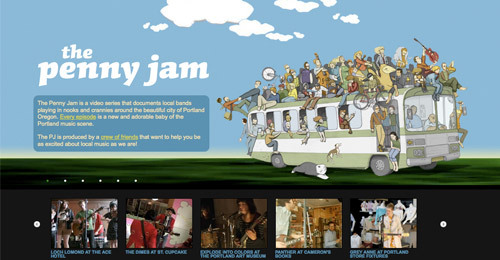 The Penny Jam is a video podcast and web series produced by Scott Carver and Sean Whiteman for Truckerspeed Productions. The Penny Jam is an ongoing web series that chronicles Portland bands playing in unique venues around the City of Portland. All filming and editing is done by Sean Whiteman, generic Scott Carver and Jon Manning. The series is created in association with audio engineers James Jacobsen of Dexterous Productions, contagion Clemeth Abercrombie of Louden Sound and Matt Huiskamp of Thoughtless Productions.